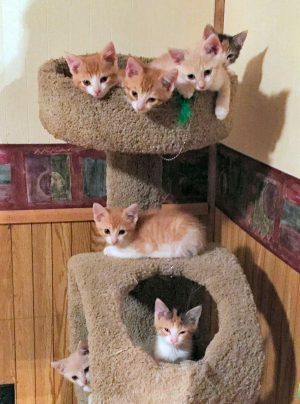 OSWEGO – June is adopt a cat month. We’ve got kittens, hordes of them, marauding through our foster homes, being adorable. These seven are nine weeks old, a perfect age for adoption. Take two – they’ll be each others playmates and lifelong companions. Your fun will be quadrupled! There are more, lots more. But that doesn’t make them any less cute.